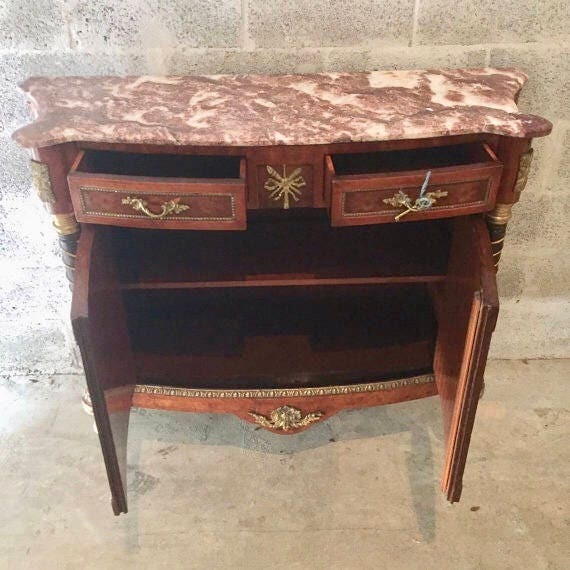 Beautiful French Bahut purchased at auction in France. 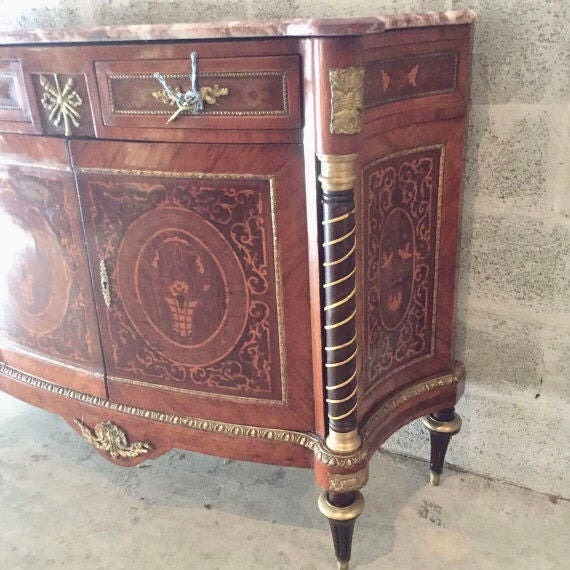 The commode was fully regilded to bring its beauty back. The item is from approx 1870 and fully restored. It was a beautiful heavy marble top and lots of decorations. The front Bahut has floral patterns and sides. Both sides were crafted into semi-circular shape called CALVE. The piece is original and NOT new. It will show normal wear and tear. It is sturdy for everyday use. We have the key as you can see attached to the right top drawer. Also, the top corner of the marble appears to have been fixed in the past. Unclear if this was done before auction or years ago. Dimension: 45.5"W x 16"D x 38.5"H.
*This is an original antique piece. 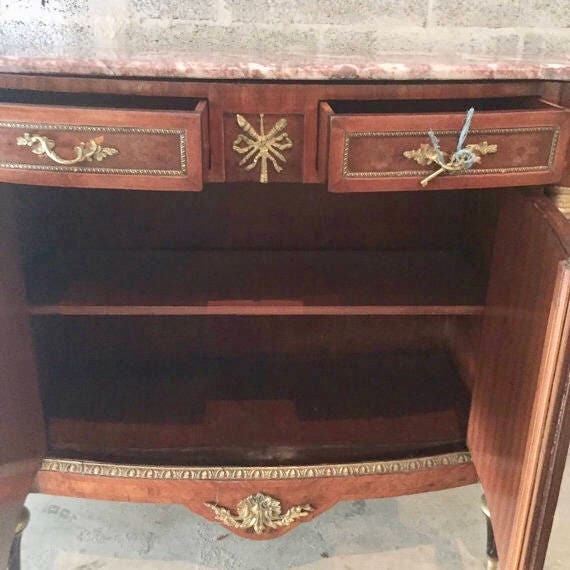 All antique items show signs of wear and tear. The item will have scratches & dents and the fabric is expected to have flows, be dirty, and sometimes a bit damaged. If the description doesn't say "NEW FABRIC" then please buy this item expecting to potentially have to reupholster. We can do this in Florida for en extra cost. Buyer is always welcomed to send us their fabric. All "SALES ARE FINAL". 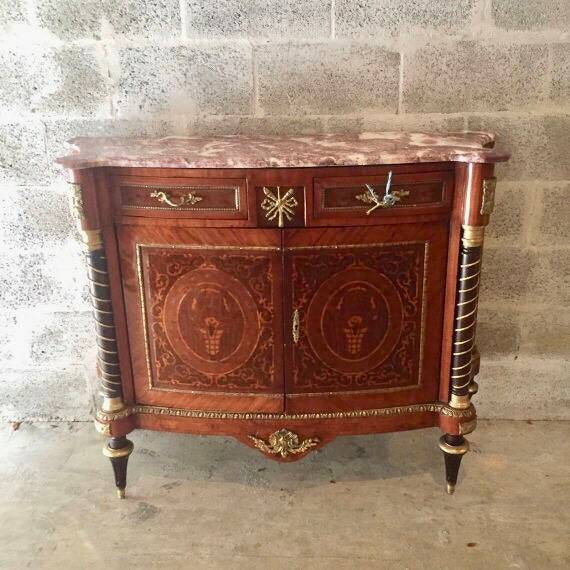 Please keep in mind there's cost associated with bringing these pieces from Europe and for refinishing the frame. If buyer purchases a piece in Europe, please know there might be delays because these come by sea. To avoid any issues, please read our shop policies. If for any reason buyer needs to cancel and files a charge back with their credit card, buyer agrees to pay a 20% restocking fee. All deposits made on purchases are non-refundable. Delivery is door to door and out of our control. We find a shipper and they select pick up and delivery date. We do not own a trucking company and cannot do deliveries ourselves. 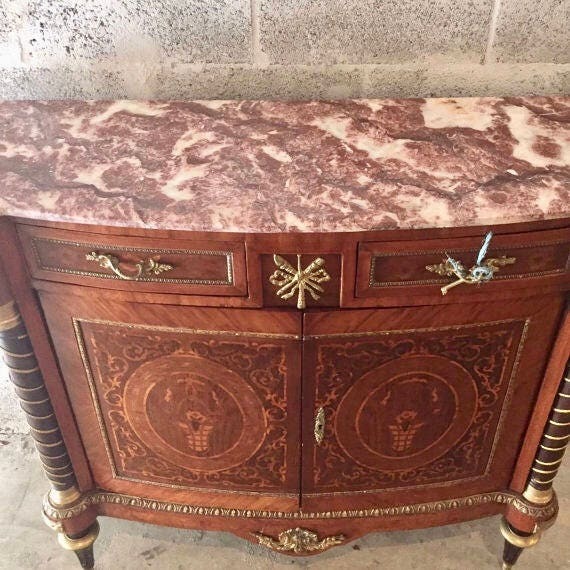 We buy all of our items from Europe in Estate sales or Auctions. Aside from chairs, we bring coffee tables, mirrors, consoles, lamps & chandeliers. We can refinish the frame color in Gold or Silver Leaf if the item is in Italy. If the item is already in Florida, we can only reupholster.